The Sorvall Legend RT Refrigerated Centrifuge marries speed and capacity with a wide selection of rotors and adapters for reliable high capacity use. This benchtop centrifuge can run up to 3 liters in a single run with a temperature range of -9°C to 40 °C to help protect temperature sensitive samples. This tabletop centrifuge gets higher capacities up to higher speeds with a speed range of 300 rpm to 15 000 rpm, in 10 rpm increments, depending on the rotor. The Sorvall Legend RT has user friendly functionality with easy soft touch keypad for one touch control of speed, programming and pre-cooling functions as well as setting speed, RCF value, desired run time and how quickly the instrument accelerates and decelerates on a run. This whisper quiet centrifuge is easy to maintain as well with a brushless motor, and a SMARTspin imbalance detection system for safe use. 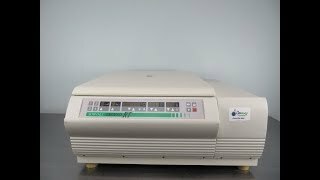 This sorvall centrifuge easily accommodates blood collection tubes, conical tubes, flasks, and micro-tubes. The Legend RT is ideally suited for both research and clinical separation needs. This listing for a Sorvall Legend RT comes with a clean bill of health, and has been carefully inspected. All of our lab equipment comes backed with our standard warranty. Should you have anyquestions, please dont hesitate to contact us.